Anonymous RAF Spitfire Mk. Vc Trop is serviced on a Sicilian airfield, believed to be Comiso, alongside a Messerschmitt Bf 109G-6 left behind by the previous owners, II/JG 53 ‘Pik As’. The time was probably August 1943. The RAF unit was not disclosed with the original photo caption, so perhaps readers can help with identifying it. 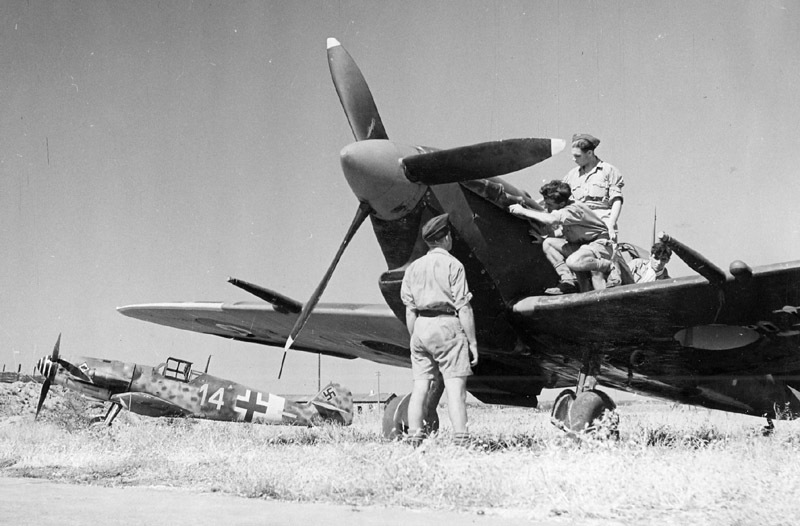 Interestingly, the Spitfire seems to have part of its lower surfaces – port wing and fuselage – painted in black. Spitfire is in solid dark blue colour with exchanged starboard wing in day mirror camouflage.